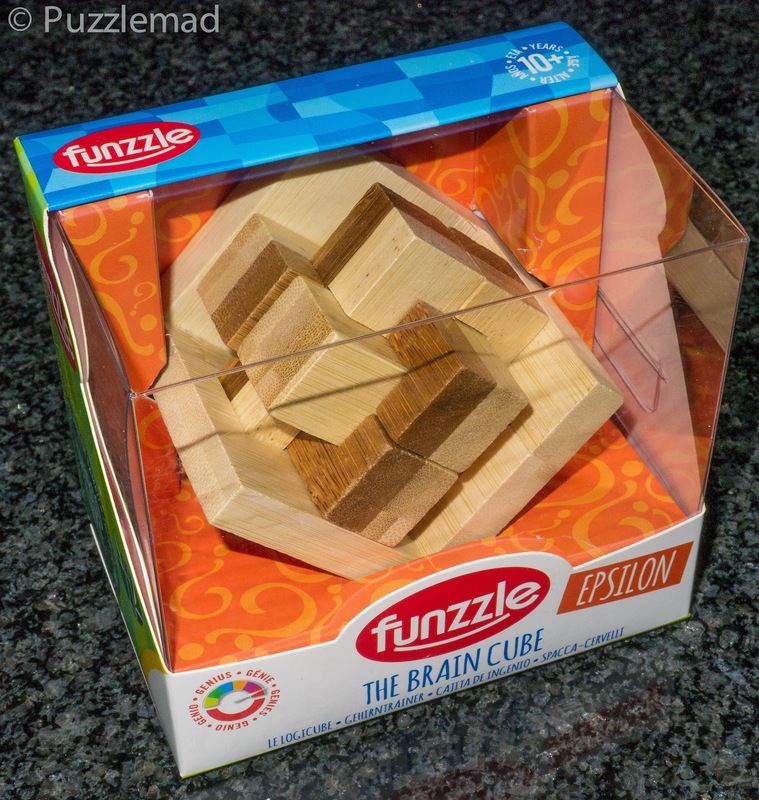 PuzzleMad: Funzzle puzzle - Epsilon! Returning to my more mass produced puzzles - I planned to "quickly" solve and review one of my Puzzle Master stash for you today. I say quickly because yesterday (on Valentine's day) I abandoned the beloved Mrs S to attend the 17th Midlands Puzzle Party at Allard's house and left her feeling rather sorry for herself - yes I had finally gotten over my Manbola but it had mutated and infected her and she was feeling shocking! Mutated into something FAR more virulent - the deadly SHEbola! In fact whilst I was away she was obviously feeling in need of medication and I found an 'empty' this morning. This either means she had hit the bottle in Valentine's day grief or just needed something to help her sleep through the tidal wave of mucus that comes with the 'bola variety of illnesses! Having said that I wanted to turn out a quick solve and review, I have to sheepishly admit that this one wasn't quick at all! In fact it took me a couple of hours! My last blog post was about caged burrs and mentioned the fabulous constrained burr set from Eric Fuller and I therefore decided to follow it up with something similar which is open for everyone to buy at a reasonable price - this is the Epsilon puzzle. 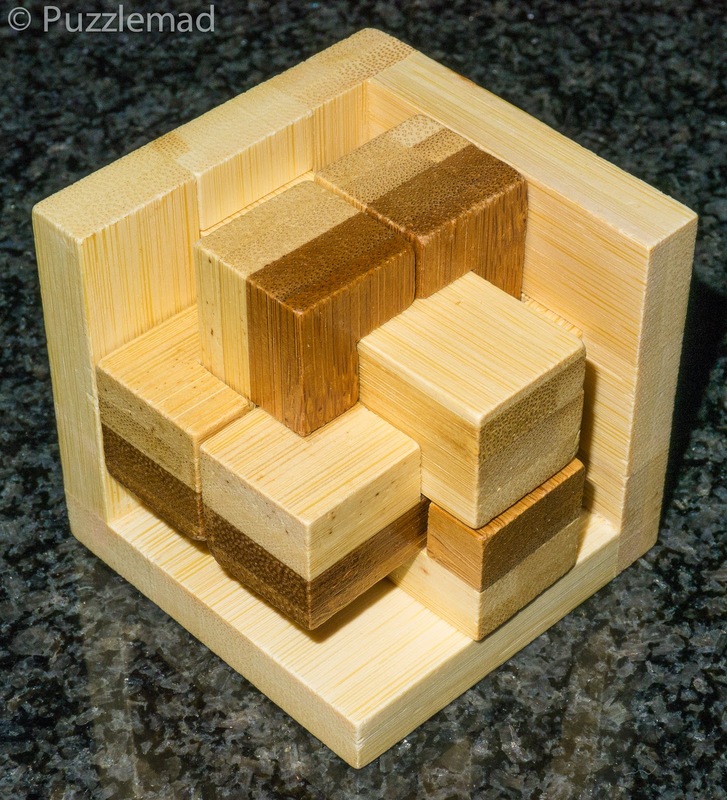 I leapt immediately when I saw this new series of puzzles available at Puzzle Master - they appear nicely made from bamboo and are therefore from a sustainable wood and look to be reasonably cost effective at just $14.95. I could not reassemble it before writing this and have the pieces sitting next to me. I will give it a try after I have published but in the interest of information for this review I made a Burrtools file for it and discovered that there are 101 possible assemblies without using the colour scheme to constrain placement and the final level is definitely not trivial - it was level 1.20.2.3.2 (a total of 29 moves for disassembly) - definitely a long way from my initial "easy" expectation. If you are not sure about getting into burrs then this is a really good start as it doesn't cost you much at all and will give a reasonable challenge. It also will look quite nice on the shelf! I have managed to acquire a few new toys recently - I have posted a bunch of photos on my New additions page to show them off (I don't want to dilute my review) - so if you are interested in seeing what is currently clogging my already horrendously messy desk then look there. This was before all my recent acquisitions! HELP!!! 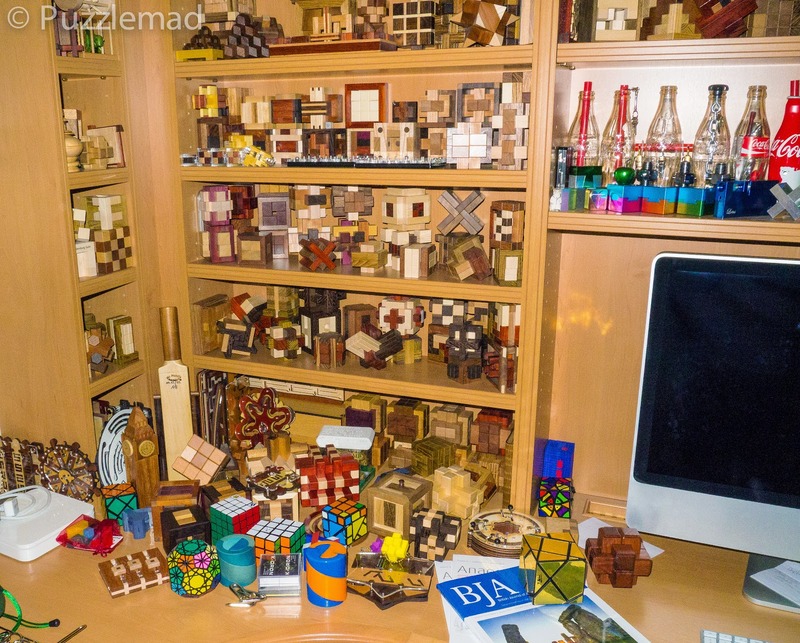 I'm more into puzzle boxes, but I'm afraid to buy Bits and Pieces reproductions as they don't seem to always work according to Brian's reviews. Hi Johan, I try to review cheaper ones every other week if possible for that very reason! I agree with you about Bits and Pieces puzzles - they are very poor and often fail! Let us know how it goes with the Fight Cubes. I bought one 4x4x4 last summer, but I have been disappointed with the fit. 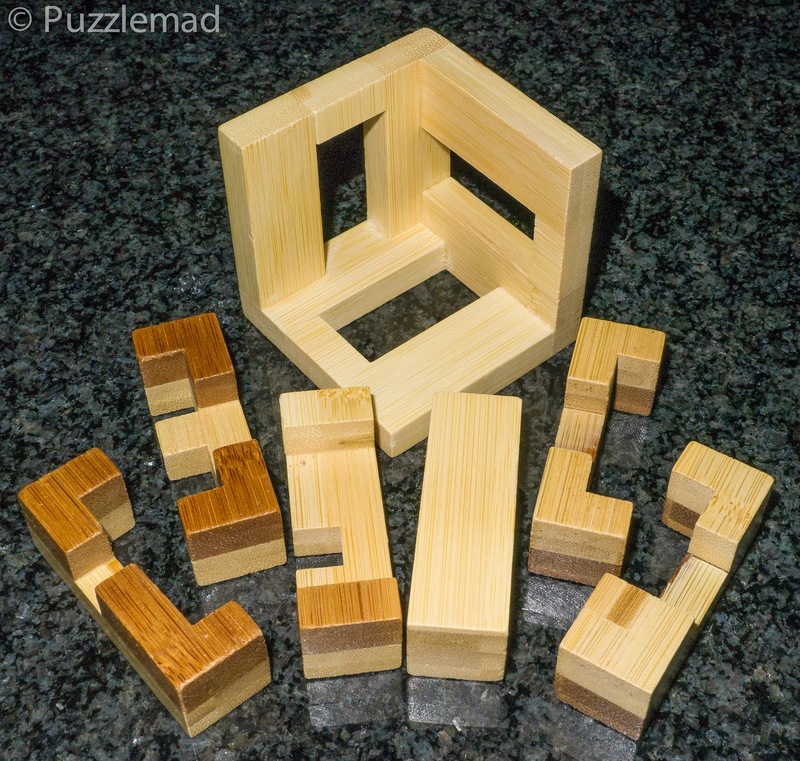 The puzzles I have made with it have ended up being too tight, it is also hard to keep complex pieces from coming loose. John Rausch said the same - so I do have some trepidation but Richard has given some tips and I'm hopeful that it will work. I'll let you know! "This was before all my recent acquisitions! HELP!!!" Nice try! I think I'll keep them and try to tidy up! A Burr so Tough it had to be Caged!